After many tries, I finally decided on this cover. Gone is the man, replaced by the more muscular guy in this photo. Since I purchased the photo, don't be too surprised if you see the bearded man on a future book cover. Mostly, though, I had trouble finding the right wolf to use. 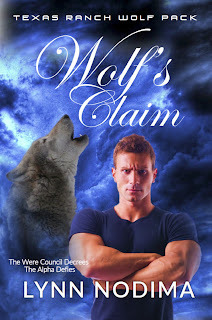 Now that I have decided on a wolf, I think I will use the same wolf and blue background on all future covers, and just change out the character on the front. Now, about the story of Wolf's Claim. At this point, I have just over 21,000 words. The climax is still ahead, and I'm really excited to write it. New characters introduced in the Wolf's Son short story will make an appearance in this book, as well as most of the characters from Wolf's Man (Book 1). I am working on a way to get you a free copy of Wolf's Son. To get it, you will need to opt-in to my mailing list for the Lynn's Muse Newsletter. You are free to opt-out at any time. Just scroll to the bottom of any email, and click the link to manage your subscription. A page will open giving you the option to opt-out. Unfortunately, I am having some trouble getting the automation sequence to work. As soon as I figure it (today or tomorrow), I will add a post about Wolf' Son. I'm off to work on Wolf's Claim. Have a great day! The free opt-in for Wolf's Son now works. Get your copy by clicking the cover image on the right side of the screen. Enter your e-mail address, then verify your want to join my list when you get the verification email. You will receive an email welcoming you to my list, and then another email with the link to download your copy of Wolf's Son. The cover has changed again!